Beautiful certificate from the Republican Valley Railroad Company issued in 1921. This historic document was printed by Omaha Republican Print and has an ornate border around it. This item has the signatures of the Company's President and Treasurer and is over 88 years old. 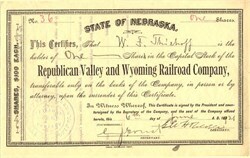 The Republican Valley Railroad Company was organized in Nebraska in 1878. It planned to extend a rail line from near Hastings southward to Red Cloud, then westward, eventually ending in Denver, taking them through the existing communities of Republican City, Alma, Orleans in Harlan County. Hearing Indian tales of the river's behavior following heavy rains, surveyors staked the route on the "second tier" of land north of the river, deciding it was unwise to risk their investment along the banks of the notorious Republican. Grading started at Naponee (Franklin County) in mid-November 1879 and was completed across Harlan and Furnas counties to Indianola (Red Willow County) by the end of February. Despite the amount of hand labor that was needed, and unavoidably poor living conditions for the works, construction proceeded with remarkable speed, ranged from a half mile to just over a mile per day -- weather permitting. Rail laying continued westward. Orleans was declared open to traffic on Leap Year Day, February 29, 1880, and enjoyed "terminal status" until the end of April when the line reached Arapahoe.